Having negotiated classic albums lost to corporate slapstick and an apathetic UK scene that for a long time couldn’t get its arse in gear, Blak Twang is undoubtedly a cornerstone of UK hip-hop. The boy Rotton is as British as bangers and mash, holding down South London via Birmingham and Manchester with a gong-heavy mantelpiece, and a collection of air miles best described as ‘mega’, such is his international acclaim. A perennial stage and festival rocker, Twang’s standing stretches back to his revered LPs from the 90s. The ‘lost’ but soon to be re-released Dettwork Southeast – which would evolve into 19 Long Time: Live from the Big Smoke, complete with the same label complications – made Hip-Hop Connection’s top 5 UK hip-hop albums of all time. Quite simply, the man is no nonsense. 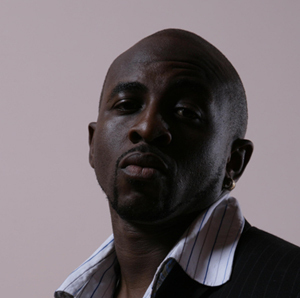 Now heading his own imprint, Speaking from Xperience follows the mostly Twang-produced Rotton Club from 2005, which showed Twang in unflinchingly speaker-shanking form (Beef Stop proving he can still bare-knuckle box with the best of ‘em), in between getting his groove on and speaking as a sage of the UK scene. Kik Off – something of a Blak Twang breakthrough at the third attempt hit the shelves in 2002, divulging tales and tactics direct from the dugout, it yielded clever conceptual cheek (Dirty Stopout Uncovered) and collaborations with current transatlantic songbird Estelle on Trixta. Between them flowered music channel dominators and festival stage pivots, such as the reggae hand-raiser So Rotton and public health announcement GCSE, taking their place in a classic, multi-dimensional back catalogue already holding the likes of Red Letters and Real Estate. Twang’s elder statesman status means he’s a natural spokesman for home-grown hip-hop, whether defending the scene he helped put back in the shop window on prime-time television, or his battle-hardened tones meaning every track he blesses is given a thick coating of experience, knowledge and wisdom. But Twang has never been one for relying on high-fiving himself, preferring the oft-cited defiance of letting the music talk for itself. Ignited by the jump-off single Help Them Lord – a crashing, rousing extension of Jahmali’s So Rotton chorus – Speaking from Xperience has him snatching back his throne, and getting nice and comfy on it while he’s at it. Right from the starter’s gun, Twang resumes domestic sovereignty on the apocalyptic Legends, trading breathless show-n-proves with Sway, and Nah I Ain’t Done relishes putting impudent inquisitors back on the shelf. Tony Rotton has always produced his own beats whilst working alongside various talented beatmakers. This time around collaborations have come from First Man and Silvastone Beats on production and sharing mic time with right-hand man K9 as well as Kanye West connect Rhymefest, Uk’s own up and coming talent Tor and Nigeria’s MTV award winning singer Tuface Idibia Rotton’s unshakeable, knuckle-whitening grip on the mic steadfastly remains. Once a lyric’s spat, it stays spat, lamenting the easily influenced on Champagne Lifestyle and Nu N’uh alongside Estelle. Resting on laurels has never been a good look, meaning the maintenance of survival instincts is essential, developing into a one-man amnesty on Cant Truss Dem, How Long, and So Hard rummaging through old soul 45s to score tales of today’s harsh realities. Taking a moment to survey his status, the memoirs of Raplife and ‘96 pick up where Ain’t Done 2 Bad left off. Hey People switches up to grime-shocked pressure, epitomising the Twangsta moving away slightly from his usual block-knocking, ragga-streaked beats and presenting new erudition in higher definition, full of battle royale fanfares and titan-grappling strings. That said, Click n Roll has Twang spitting a saliva-flying inferno over club-toppling drums, and though he may not admit it himself, Twang can be a chivalrous gentle giant, as For the Summa confirms. They say there’s no substitute for experience, and the return of the Rottonous One vigorously and determinedly upholds this maxim.